Whether terms in a contract are likely to be deemed to be unfair depends on the applicable regulations. It is in the first instance important to distinguish between business to consumer, and business to business contracts. Contracts between businesses are governed by the Unfair Contract Terms Act 1977, or UCTA for short. Guidance relating to consumer contracts can be found in the Unfair Terms in Consumer Contracts Regulations 1999. Businesses are in effect free to enter into commercial agreements with other businesses on whatever terms they see fit, so it is vital to ensure that you understand what you are agreeing to before you sign! Notwithstanding this freedom, there are certain standards laid down by the UCTA. Exclusions of certain types of liability are prohibited, such as excluding liability for death or injury, as is anything that is deemed not to be ‘reasonable.’ Unfortunately there are no specific definitions in the Act as to ‘reasonableness’, but guidance can be sought from case law. In effect it is not unlawful to include a term in a contract that may be unfair or unreasonable, but the issue arises if the validity of the contract is challenged. If the court finds that a particular clause is unreasonable, it could mean that the party to which it relates has no obligation under that clause, or in certain circumstances could mean that the whole of the contract is void. This is obviously undesirable. Because businesses have less protection than consumers in terms of contractual unfairness it is always advisable to seek legal advice on whether or not your contract is enforceable. This is particularly the case if you are habitually selling goods or providing services as a business. One such example could be a restrictive covenant in a franchise agreement. Often franchisors seek to prevent franchisees from competing with them once the franchise agreement has expired or has been terminated. They do this by including a clause in the franchise agreement that prohibits the franchisee from carrying on business for a period of time after the end of the agreement. In the event of a dispute, the court may find that the clause is unreasonable in which case it would not be enforceable. The unfortunate outcome of this could be that the franchisor has no means of preventing or reducing the ex-franchisee’s ability directly to compete with the franchise business. What is more, the ex-franchisee has all the benefit of the franchisor’s trade secrets which he can use in competing with the franchisor. 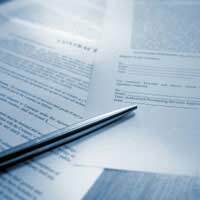 There are more stringent rules in relation to contracts between a business and a consumer. As has been demonstrated in the recent case brought by the Office of Fair Trading in relation to bank charges, a contract cannot have any clauses that ‘cause a significant imbalance in the parties rights and obligations’. Of particular note in this case were the issues relating to penalties for late payments or going over overdraft limits. Banks were charging customers up to £30 for sending out a letter, which was not commensurate with the actual loss suffered to them as a result of the consumer’s actions. Importantly, terms that are not covered by the unfair terms regulations are those that have been individually negotiated, contracts between private individuals, and contracts made by individuals who are not acting as consumers, for example in relation to employment or setting up in business. I did work for someone ,our verbal agreement was that I would do some building work to his place and agreed on getting paid a daily rateand that I would get a micro busas part of our agreement.I did some work around a pool and do to weather changes some minor problems occured.I must still do some brickwork as agreed on and is waiting on this person to get the plans.The problem is that I'm now waiting on this plans since September 2015 for this person to give word about the plans.it now seems to me that because of this minor problem he is having with the pool area he wants to end our verbal agreement without giving me a chance to meet with him to see if we can find a way forward or come to some sort of agreement that makes both of us happy.Been trying to arange a meeting with this person but all effort fails .Since last year September 2015 I tried to get word of the plans to finish what I still need to do and close the agreement we have,but all my efforts seem to get a diffirent excuse in why its taking so long for the plans to get thru.The problem with the work done at the pool is fixable and I suggested to him to fix it without getting paid.Do I hav any legal rights in this matter. And if what do I do? I have been booking events in a hotel for six years. I had a contract, signed by myself and the hotel for a forthcoming event. They suddenly cancelled my event at the hotel, despite my legal contract, although I had paid advertisements in magazines and numerous bookings. I lost the advertising money and had to repay bookings and they refused any compensation. They cancelled my event because someone had offered them more money for an event at the same time as mine, although I had a contract signed by them. I was to book another event at the hotel, but had to cancel a month prior to it due to not enough bookings, but said I’d book it a few months later when the bookings improved. They have now said they will sue me for £10,000. Their contract states they can take legal action against me if I cancel an event, but the contract has no terms for them cancelling an event of mine. Surely this is an unfair contract as it is one-sided as they can punish me for a huge sum for a cancellation on an event, but they can cancel my event without any repercussion in the contract. I'd take some legal advice regarding this, as you have had to re-schedule the event after their cancellation (not your fault). Plus, if they have cancelled your event for money, you may be able to counter-sue. Having failed to sell my late mum's house and paying a mortgage on it I rent it out to a tenant and ive a full management contract with reeds rains for under £50 per month. earlier this year they had a contractor travel 60 miles to unblock a drain for which he wanted over £300. I did not give permission for this work to go ahead even though I was contactable by phone and they claimed for additional work to the original problem which I also hadn't authorised and dont believe was done. I challenged reeds rains about this and was told that they did not expect to hear from the contractor again. I thought this odd and told them I was prepared to pay a fair charge for the work actually done. I phoned twice to get to the bottom of this but received no return call. I have now found out that the contractor was the boyfriend of the reeds rains employee's sister. I think I caught reeds rains'employee trying to rip me off so want to terminate the contract as I cannot trust them. they also failed to arrange for repairs to be carried out when I asked them to and my tenant says they've failed to respond to her queries too. reeds rains have told me they want almost £600 (1 months rent plus vat)to cancel the contract. this is stated in the contract but I misread it and thought it was one months management fee. is the failure to act in my best interests and failure to arrange work I requested a breach of contract? and can I challenge the almost £600 termination fee as unreasonable given what they'll suffer from the loss of the contract and as other letting agents charge around £75. surely there's a law against a letting agent conspiring with a workman to fleece a landlord? any help much appreciated. thanks. I hope you have logged all the correspondence you have had with your agent. I suggest you make sure every time you make contact, you do this by email, so you can record the lack of response. However, most letting agents and estate agents have a complaints procedure you can follow and they should give you this information if you ask. I have included a link from Shelter herewhich should direct you on how to make a complaint. I can't advise whether or not you are in the right. However, should you need to seek some legal advice, you could always try the JustAsk website, link here. I hope this helps. having failed to sell my late mum's house and paying a mortgage on it i rent it out to a tenant and ive a full management contract with reeds rains for under £50 per month. earlier this year they had a contractor travel 60 miles to unblock a drain for which he wantedover £300. i did not give permission for this work to go ahead even though i was contactable by phone and they claimed for additional work to the original problem which i also hadn't authorised and dont believe was done. i challenged reeds rains about this and was told that they did not expect to hear from the contractor again. i thought this odd and told them i was prepared to pay a fair charge for the work actually done. i phoned twice to get to the bottom of this but received no return call. i have now found out that the contractor was the boyfriend of the reeds rains employee's sister. i think i caught reeds rains'employee trying to rip me off so want to terminate the contract as i cannot trust them. they also failed to arrange for repairs to be carried out when i asked them to and my tenant says they've failed to respond to her queries too. reeds rains have told me they want almost £600 (1 months rent plus vat)to cancel the contract. this is stated in the contract but i misread it and thought it was one months management fee. is the failure to act in my best interests and failure to arrange work i requested a breach of contract? and can i challenge the almost £600 termination fee as unreasonable given what they'll suffer from the loss of the contract and as other letting agents charge around £75. surely there's a law against a letting agent conspiring with a workman to fleece a landlord? any help much appreciated. thanks. I wanted to buy CD with portfolio pictures and in agreement there were term that buy signing the agreement I give up my rights to cancel the purchase in 14 day period. Is this legally binding contract? Can somebody ask me to give up my rights? Is law protecting me from myself? I work for a company on a self employed basis providing a service for many clients. I have recently been approached by one of the clients to work for them full time doing a different job. It's a great opportunity for me. However my current employee is up in arms. I told my boss and asked to meet for a discussion out of courtesy, he gave me the go ahead and said good luck and asked that all I do is work my notice. No problem.He has now changed his mind and later the very same day said I am breaching my contract and that I can't work or seek work for any of our a clients whilst doing my current job. My contract says I can't work for a client within 18 months after working for him.Does it make a difference that they approached me?Also my boss will not be affected and his company will keep their contract ongoing with the client. Where do I stand? I hope you can help, thanks for any feedback.